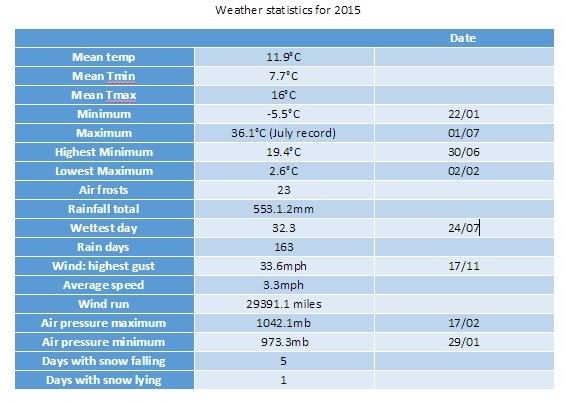 Though it was devoid of snowfall February 2016 was average for temperature and sunshine and on the dry side. Some sharp frosts made for a couple of stunningly sunny days, “ski resort weather” the kind of days that were absent during the first half of winter after the super mild December. Rainfall of 35.1mm was 90% of average – the driest February for three years. Mean temperature for the month was 5.4C, 0.1C above the 1981-2010 mean. Sunshine was just above average. Over 79 hours were recorded, 108% of what we can expect to see during an average February. The wettest day occurred on the 7th with 11.6mm. So what has March got in store weatherwise? The late winter synoptic pattern could see the first snowfall above 1cm over the coming days and next week though amounts are likely to be small and temporary and restricted to night hours. The pattern bringing this messy wintry mix is low pressure moving SE across the UK between now and the weekend each band bringing progressively colder air across the UK. Much of the precipitation will be showery although Friday looks more interesting as a secondary moving south brings cold N or NE winds. Models suggest next week will see high pressure from the west displacing this cold N. The timescale is very uncertain and it may be toward the second half of next week before the general theme of dry and settled conditions prevail. Frosts at night remain likely and daytime temperatures remain close to or a little below normal. Overall the first half of March does not look like it will offer much in the way of spring weather. My long range forecasting method suggests the most likely scenarios to be rather cold or cold, though both are only at 33% probability. Something average or below works out at 83% probability. The only mild indicator is for something rather mild at 16% probability. A dryer than average month looks most likely at 66% probability. Something wetter than average works out at 34% probability. Very dull conditions look most likely at 83% probability. So to sum up: Mean: 5.9C, rainfall 31.6mm, sunshine 68 hours. Taking all of the above into account perhaps the most likely scenario will be that the month will be predominantly anticyclonic with lots of gloom during the day and night frosts, varying in intensity. So to sum up: Mean: 5.9C, rainfall 32mm, sunshine 67 hours. 1st: Cloudy, breezy start. Sunshine PM with nacreous clouds reported on east coast. Cold in a brisk wind. 2nd Cloud gave way to sunny spells around 11am – then feeling cold in a brisk wind. 3rd Cloudy and cold start then mostly cloudy with a cold wind. 4th Bright though mostly cloudy start. Cloudy through the day with odd spot of drizzle through the night. Area of very light rain gave about 0.1mm before 9am. 5th Cloudy with light drizzle up to 11am then briefly bright before more drizzle arrived. 6th Cloudy to start with odd burst of drizzle. Very windy and feeling chilly in wind. Rain arriving after 8pm. 7th Sunny start though cloud bubbling up after 11am and feeling cold in wind as dew point fell away. A very heavy, violent squall swept through at 2245z then blustery through the night. 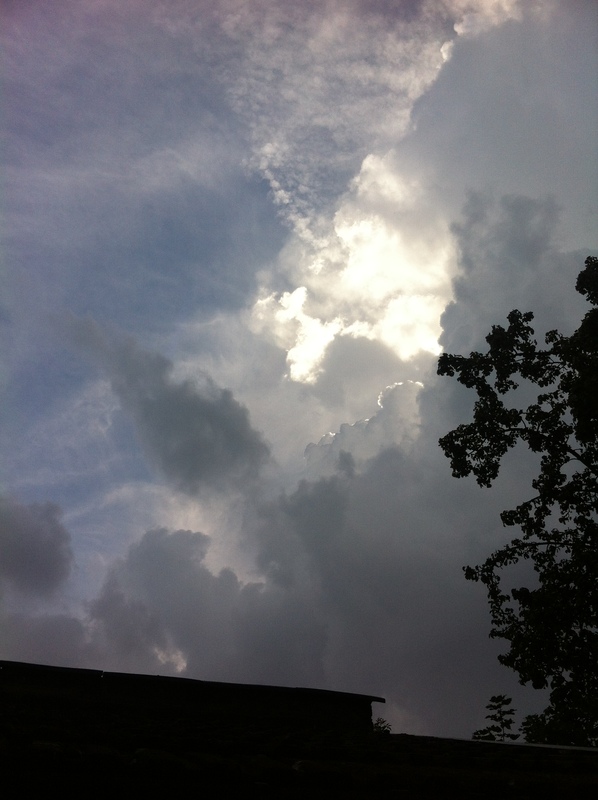 8th Sunny start quickly gave way to squally showers which were mostly light. Strong winds into the afternoon with squally but light showers. Chilly overnight. 9th Cloudy and cold start, briefly clearing before noon before clouding over again. 10th Cloudy start though with some weak brightness lunchtime. 11th Mostly sunny all day and calm – warmth of the sun can now be felt. Just a few cirrocumulus. Stunning. 12th Bright start but cloud thickening. Day felt cold though as DP fell away. 13th Cloudy start with drizzle at obs time. Cold wind through to lunchtime and intermittent drizzle. 14th Bright, cold start with cloud increasing through the morning. 15th Bright, cold start with lots of wispy cirro-cumulus around. .
16th Stunningly sunny and frosty start. Just patchy cirrus through the day. 17th Cloudy through the day until 5.30pm when drizzle then rain set in. 18th Initially cloudy but then quickly brightened up. Sunny spells through the afternoon. 19th Sunny, clear and frosty start. Cloud began to build mid morning becoming overcast by noon. Light rain spread in about 4pm. Milder. 20th Bright start but cloud and wind quickly built. Light at times moderate rain fell through the afternoon – a thoroughly miserable day. 21st Dull, dry day up to 1pm. Very mild. Staying cloudy overnight with rain arriving at 5am, most falling until 7.30am. 23th Cloudy with clearance at 11.30am. More cloud appeared to leave sunny spells. Much advection but cleared to leave frosty night. 24th Sunny, clear and frosty start. Lots of sunshine but quickly turned cold after dark with early frost. Cloud then wind lifted temperature though. 25th Bright start but quickly clouded over to become cold. Clearance in evening allowed temperature to fall quickly but cloud moved in and breeze picked up to prevent a sharp fall. 26th Cloudy, cold start. Brightening up to sunny spells by 1pm. Too much cloud overnight for a frost. 27th Bright start but became cloudy through the day with a cold easterly wind. 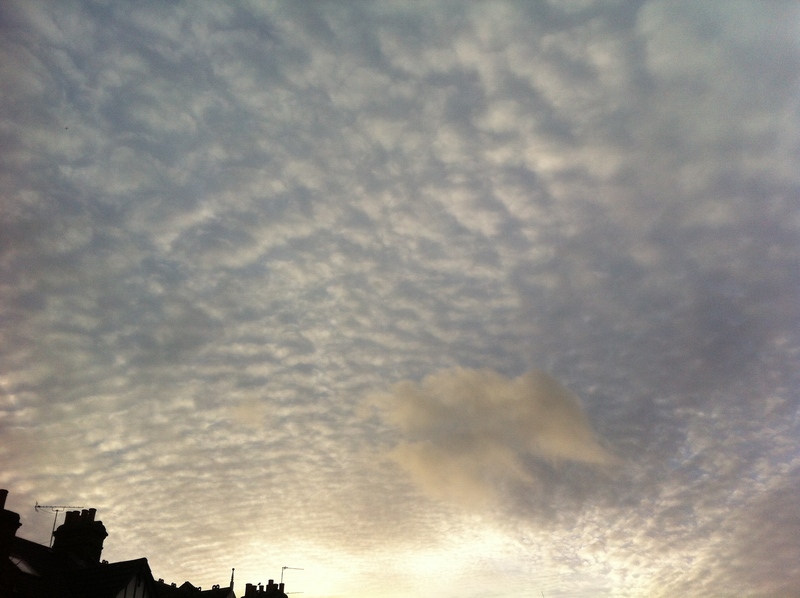 29th Cloudy start but soon brightened up with long sunny spells before clouding in again early afternoon. In terms of weather events September was a relatively quiet month save for the two thunderstorms that seemed to mark the Scottish Referendum as the results became apparent in the early hours of Friday 19th. September 2014 was warmer than average; the mean temperature of 16.4C was 1.1C above average, making it the 16th warmest September since 1797: 1.6C warmer than last September, the warmest since 2011. The month was marked with lots of dry, sunny days, the two thunderstorms on the 19th contributing 89 per cent of the rainfall for the month. It was dryer than average – the 44.8mm that fell is 86 per cent of what we would expect in a normal September. Despite this it was only the driest September here since 2011. Sunshine was below average with 126.9 hours recorded – that’s 91 per cent of mean. The sunniest day was on the 8th when 12 hours of sunshine were recorded. There were 2 days with thunder recorde. 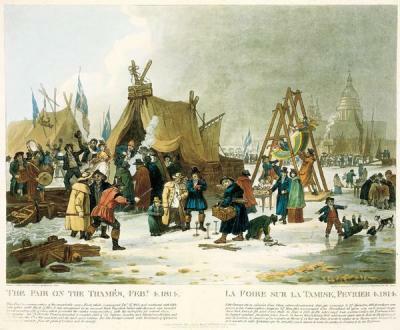 It is 200 years ago this month that London enjoyed its last frost fair. Weeks of hard frost from the day after Boxing Day was enough to freeze the river between the old London Bridge and Blackfriars, enabling dozens of opportunist London traders to set up stalls and booths selling souvenirs, drinks and food. Unlicensed gambling, drinking and dancing was the order of the day for those brave enough to venture on to the ice. A sheep was roasted on the ice with the public charged to look at it, and charged again for a slice of “Lapland mutton”. At one point an elephant was led across the ice at Blackfriars. The ice was however, not very stable. Boatmen deprived of an income charged visitors a penny to cross planks to get on to the ice. They were on hand to rescue two women who fell through, although a plumber carrying lead was not so lucky. Though changes to the flow of the Thames has vastly reduced any chance of a frost fair being repeated I’ve often wondered what the day to day climate would have to be like to freeze the Thames as it did in 1814. 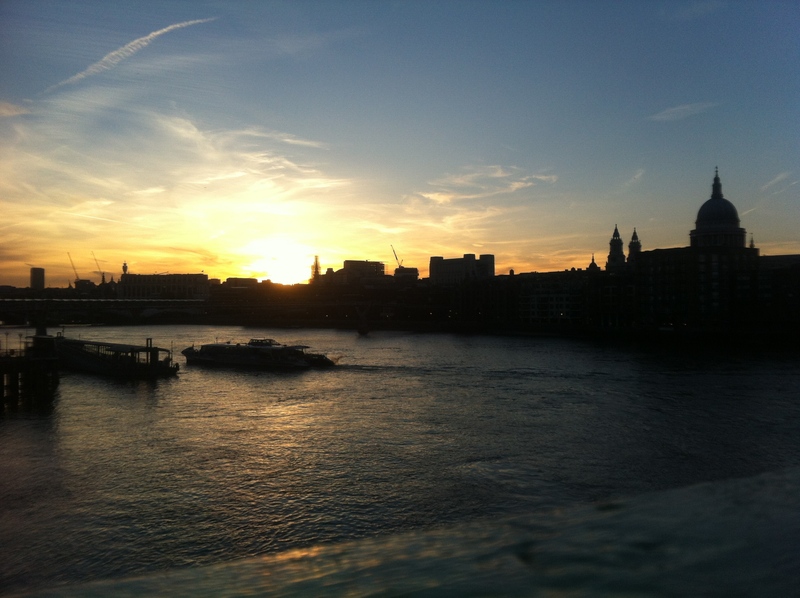 Luke Howard’s Climate of London provided a starting point. 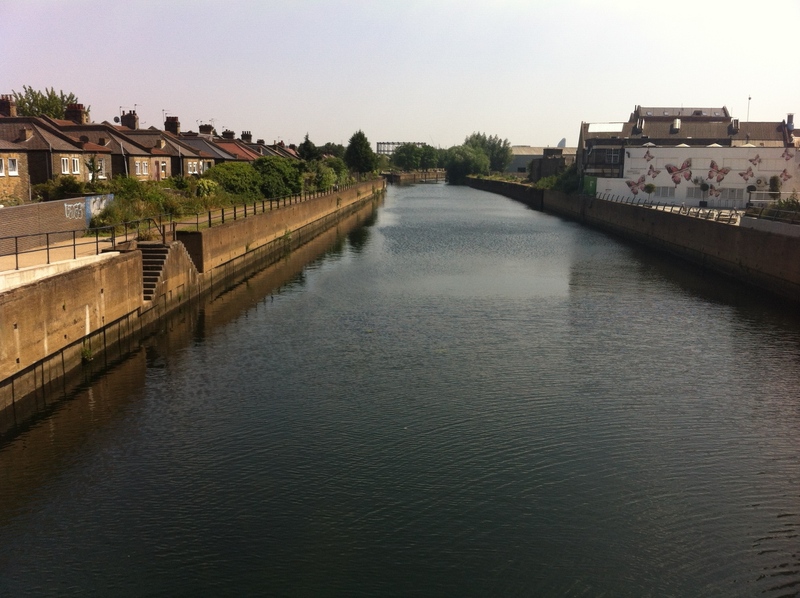 His pioneering measurements of the atmosphere taken outside his laboratory by the River Lea in Stratford, though not as accurate as today’s readings, provide an excellent insight into just how cold the season was. 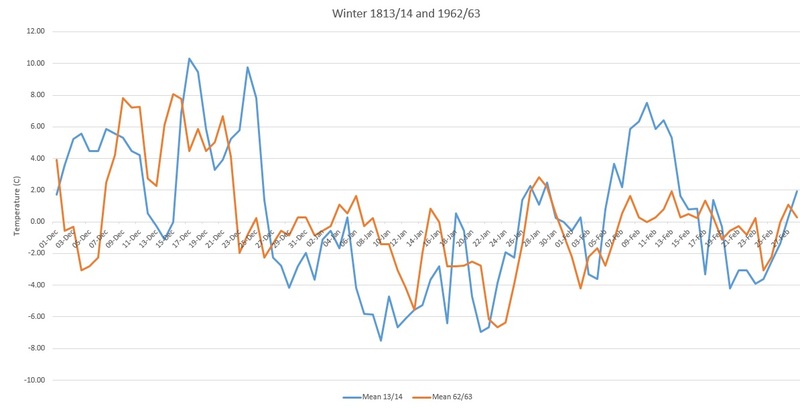 I was surprised to find that the stats compare well with the winter of 1962/63 – the coldest winter in recent memory. Obviously Howard’s readings would not have been as accurate as today’s – his thermometers were initially suspended in a laurel bush to shield solar radiation – but they would still have been close. I have converted his readings in Fahrenheit to Celsius and plotted them on a spreadsheet here. As well as records of temperature, wind, rain and moon phase Howard also included any notable weather events in his diaries from both home and abroad. The winter of 1813/14 started mild. On December 16th he noted that “bees quit the hive in unusual numbers for the season”. During the following days up to Christmas Day wind and rain alternated with misty, occasionally frosty, mornings – probably not unlike some of the weather we experienced last month. However, Boxing Day brought a big change: “Since the 26th we have had a succession of thick fogs with a calm air or at most a breeze from the NE. Yesterday the air cleared a little and today has been fine; a display of cirrus clouds with much red in the morning and evening sky, the peculiar smell of electricity has been perceptible of late when the air cleared up at sunset.” Howard goes on to report that there was an eruption of Mt Vesuvius in Italy. By January 5th a “deep snow brought by an easterly wind had reduced the whole scenery to the more ordinary appearances of our winter”. More snow followed on the 6th and piled into drifts on a strengthening NE’ly. The biting gusts presented Howard with yet another new winter phenomenon: snow rollers: “With the temperature at the surface 33 or 34F presented an amusing phenomenon which was pointed out by my children. Instead of driving loose before the wind it was collected occasionally into a ball which rolled on, increasing till its weight stopped it. Thousands of these were to be seen lying in the fields some of them several inches in diameter”. On the 9th Howard describes a misty morning and a snowy landscape that had a “bluish tint”. The “blueness” of the air is possibly down to the sheer cold – it was -13.3C that morning. I’ve seen something similar, a bluish hue to the air, on very cold mornings in the Alps. Howard notes that the minimum on the surface of the snow that night, the coldest of that winter, was -14.4C. On the 11th a “very red” sunrise was observed . By the 12th Howard describes the Arctic scene from his laboratory: “The River Lea is now firmly frozen and the Thames so much encumbered with ice that navigation is scarcely practicable.” Howard also notes on this date that the snow in upper parts of Hampshire and “on the Hind Head” had fallen to a depth of 15 feet in places. A slight thaw was noted on the 16th from the warmth of the earth. More snow fell on the 18th and 19th. Snow on the 20th was accompanied by a strong NE’ly. On the morning of the 21st Howard noted drifts “many feet deep”. The rest of February, and meteorological winter, appears fairly nondescript. Howard notes that on the 12th a gunpowder explosion resulting in a fire at the Custom House, 5 miles south, caused a “shower of fragments of burnt paper”. Sharp frosts and misty mornings prevailed to end of month, Howard noting the “clear orange twilights”, probably caused by the eruptions in Italy that formed a new crater on Vesuvius. Howard mentions a letter he received from Heligoland on February 21 which had also seen intense frost that was preceded by thick fogs and heavy falls of snow. The latter was 10 and 12 feet deep – the frost lasting six weeks. January 15: The masses of ice and snow had accumulated in such quantities at London Bridge on the upper side yesterday that it was utterly impossible for barges or boats to pass up. During the whole of this week that part of the Thames below Windsor Bridge called Mill River has been frozen over and has been crowded with persons skaiting. February 7: Friday several printers brought presses and pulled off various impressions which they sold for a trifle eg Printed to commemorate a remarkably severe frost which commenced December 27, 1813, accompanied by an unusual thick fog that continued eight days and was succeeded by a tremendous fall of snow which prevented all communication with the Northern and Western Roads for several days. 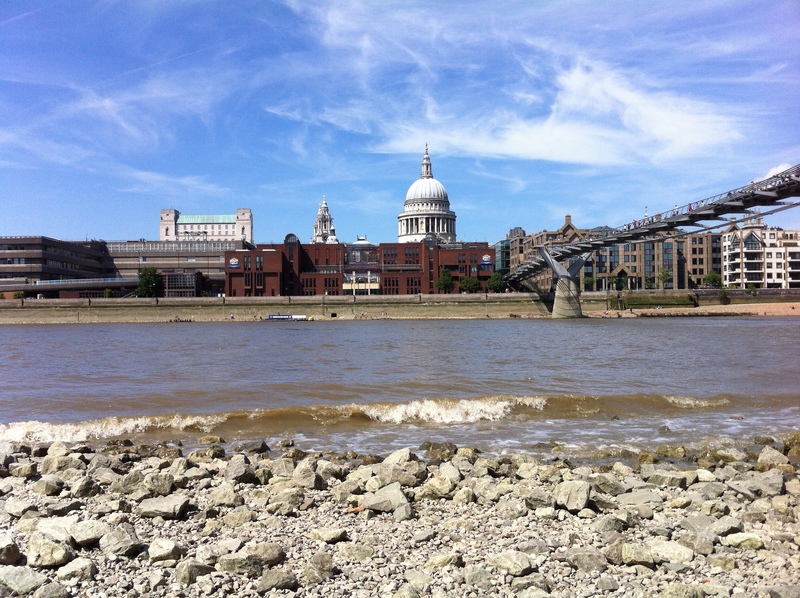 The Thames presented a complete field of ice between London and Blackfriars Bridges on Monday the 31st of January, 1814. A Fair is this day February 4, 1814, held and the whole space between the two Bridges covered with spectators. This field of ice was indeed a very rugged one consisting of 1 masses of drift ice of all shapes and sizes covered with snow and cemented together by the freezing of the intermediate surface. The deceitfulness of the latter caused as is too common on such occasions the loss of some lives by drowning. The following passage announcing the opening of the river soon after is worthy of preservation on account of the spirit in which it is written. November was colder than average with a mean temperature of 6.7C (1.2C below the 30-year average) – ranking it 69th in the series since 1881. Rainfall of 56.5mm was 99% of average – ranking it 61st in the series. 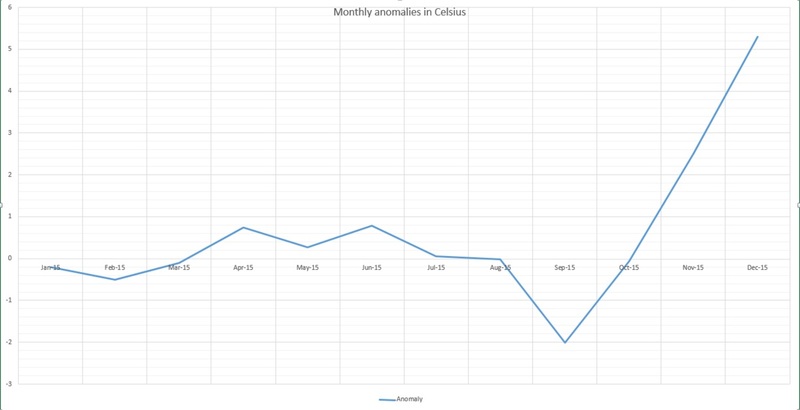 The month was just 0.04C cooler than last November – with 93% of the rain that fell in November 2012. I’m now starting to publish my monthly stats on this blog. This month was warmer than average with a mean temperature of 13C (1.2C above the 30-year average) – making it the 10th warmest in the series since 1881. Rainfall of 83mm was 127% of average.